Subaru unveiled this facelifted version of it’s luxury SUV Subaru B9 Tribeca at the 2006 Chicago Auto Show recently. This is Subaru’s entry into a more upmarket segment of the automotive market, after spending years in the rally sports sedan market with it’s Impreza. I think it’s safe to say the B9 Tribeca was designed for the SUV-crazy American market. 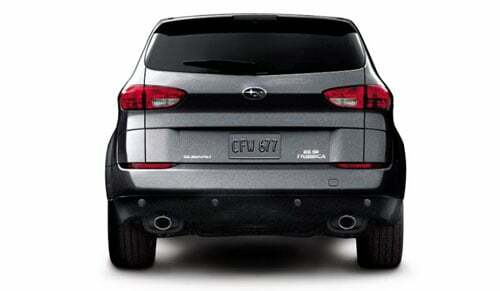 So what’s changed in this 2007 model since the previous Subaru B9 Tribeca? The engine and drivetrain remains the same, maybe because they were already fantastic to begin with. The B9 Tribeca has a 3.0 litre DOHC 6-cylinder flat boxer engine making 245 horsepower and runs on Subaru’s Symmetrical All-Wheel Drive technology. The 6-cylinder boxer is mated to a 5-speed SPORTSHIFT automatic transmission. There are some minor external facelifts in the form of a new Special Edition package which equips the B9 Tribeca with a new mesh-grille and chromed wheels. But I think no form of enhancements to the grille can save the look of the car. I really dislike the new Subaru corporate nose. They say with every strange design you’ll grow onto it and start to like it. Seems to be true for Bangle’s new BMW designs but has anyone warmed up to Subaru’s new “aircraft-inspired” corporate nose yet? The suspension has also been revised to deliver a smoother ride, not just the front and rear shocks but also the strut bars and stabilizer bars. The touch-screen navigation system option will now come with a rear vision camera to help with parking the huge SUV. In the safety department, there is a new Vehicle Rollover Sensor System which detects a potential rollover situation and deploys the side curtain airbags. Seatbelt pre-tensioners are also adjusted in the event of any potential collision. After dabbling for years in the IT industry, Paul Tan initially began this site as a general blog covering various topics of personal interest. With an increasing number of readers paying rapt attention to the motoring stories, one thing led to another and the rest, as they say, is history. An avid electronic gadget aficionado as well as big-time coffee lover, he's also the executive producer of the Driven motoring TV programme. 2020 Yamaha MT-07 to come with turbocharging? Copyright © 2019 Driven Communications Sdn Bhd. All Rights Reserved.